This is the first in a series of sporadic reports about criminally-involved people who habitually inhabit and wander downtown Winnipeg. There’s something so incredibly sad and yet telling about Mr. M. and his circumstances — also about the hard and lonely realities of his adult life, a good chunk of which has been spent on the streets of our humble downtown. M. grew up in what he describes as a “good,” religious and abuse-free home on Fisher River First Nation. He hasn’t been back there in 20 years. His dad died 40 years ago of ALS. He suspects his mom has died of old age but can’t be sure. He hasn’t seen her in two years. He knows his three brothers and one sister live in Winnipeg, but says they have their own lives. He says he speaks to them “when [he] sees them downtown,” as he believes this is where they work. He asks for nothing from them and they of him. M. survived a number of years at a Brandon-area residential school as a young man. It was an experience he describes as “difficult” — one where instructors beat him frequently when they got the chance, he says. M.’s parents also attended the same school and they were also “punished” and had their “language forced out of them,” he told a social worker. Despite these considerable hurdles, M. graduated high school and attended two years of Arts at the University of Manitoba. He’s employable, with a decent track record of steady work, and has in the past been a willing and co-operative participant in counselling and job-placement programming provided by government agencies. Up until the other day, he had virtually no criminal record except for a theft under $5,000 conviction from the early 90s. Despite these positives (and a large amount of government intervention) stability and security remain elusive for M. — who has no kids or wife to rely on. Soak that in. Drink up its sadness: There’s nothing else M. — nearing 60 years old with half a university degree and a good amount of job and life experience — can identify to do with himself other than hang around downtown Winnipeg. It gets even more sad when you consider why he hasn’t been seen in the core over the winter. M. is currently a guest of the province for at least the next few weeks as he serves out a roughly year-long jail sentence for arson, disregard life. He’s been in custody since last fall when he torched the curtains of his Alexander Avenue rooming house suite in what he told cops was a suicide attempt. 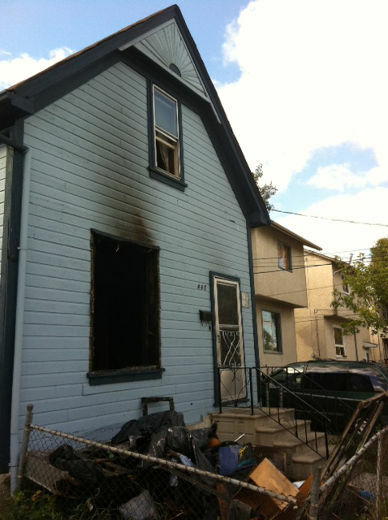 Four people, including M. himself, were injured in what ended up being a fairly dramatic blaze. The elderly caretaker of the ramshackle home was one of two people who lept from an upper-floor window to safety. M. told his probation officer he was “tired of living” and didn’t think anyone else living in the house was there at the time he set the fire. He changed his mind and fled the burning house. It was his second suicide attempt in five years. The earlier was thwarted by a friend who found him and called for an ambulance. M. wasn’t interested in talking to a probation officer about those friends, however. He did say he has about five of them, who he sees about twice a week when he bumps into them while wandering downtown. “The sole activity they undertake is to walk around downtown,” the PO notes. Sometimes, however, they go and drink at somebody’s home. It’s not explicitly stated what happened to M. in his 30s, but it appears the bottle got a good grip on him at that time and hasn’t really let go since. He started drinking at 18, he says. More frequently in his 20s. A few years later, booze became a major issue and he started finding himself repeatedly taken to the drunk tank under the provisions of the Intoxicated Persons Detention Act to dry out. He has taken at least some steps to deal with his “significant” alcohol problem. What’s worse is that M.’s mental health appears to be a growing concern as he ages. In February, he was assessed as a “high” risk to reoffend. How that might happen, that’s not explicitly stated. “Drinking too much just happens,” M. says. Sadly, that’s also when he gets suicidal. It’s not just sad that people get suicidal when they drink too much. It’s predictable. Alcohol is a depressant which also lowers inhibitions resulting in unpredictable behaviour. Unemployment is depressing, as is being devalued by others and living in ramshackle housing (or worse). Very chicken-and-eggy, the whole mess of issues around mental health, addictions/drug abuse, criminal justice, housing… once you’re disadvantaged on one front your likelihood of developing problems in the other areas increases astronomically. Unfortunately, too many of us turn a blind eye or blame the sufferer.